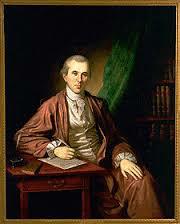 Benjamin Rush: A Christocentric Revolutionary? In the following article on Benjamin Rush, Donald J. D’Elia continues his series on the founding fathers which began with Thomas Jefferson in the last issue. Rush makes a particularly interesting study because he was avowedly Christian not to say Catholic in his approach to the American Revolution. Dr. D’Elia presents here both the early optimistic Rush and the later pessimist. The central drama concerns the building of the kingdom of God on earth-and America’s identity or dis-identity with that kingdom. The series will continue next quarter with John Adams.